Confusion and chaos reigned for a few minutes at Theodor Herzl on Tuesday morning, 9 April when High School pupils suddenly found themselves divided and herded into groups according to their hair colour and gender. The exercise offered the 21st century teenagers a small window into how Jews and other victimised groups might have felt in Europe during World War ll – and helped to prepare them for the stirring annual Holocaust Remembrance ceremony held at the school. Pupils of all cultures and faiths lit six large candles and dozens of tealights in tribute to the six million Jewish men, women and children who died during the war or in the Holocaust. Guest of honour, Peter de Decker, addressed the assembly, recounting the realities of the war years from the perspective of his childhood in The Hague, Netherlands. He vividly recalled the sirens, bombs and hunger, as well as people having to wear yellow stars on their clothing that identified them as Jewish. De Decker has lived in Port Elizabeth since 1959 and his granddaughter is a pupil at Theodor Herzl. “There were more than 140 000 Dutch Jews living in the Netherlands in 1939, but by 1945 only about 35 000 of them were still alive. Anne Frank, who wrote her world-famous diary while she and her family were hiding in Nazi-occupied Amsterdam, was about your age – just 15 – when she died of typhus in a concentration camp,” he told the pupils. Thanking the audience for their “respectful participation in remembering the victims of man’s inhumanity to man during the dark years of World War ll”, Theodor Herzl‘s Head of Judaica and Hebrew teacher Esther Levitan urged pupils to be mindful of their attitudes in society. “Remember, you are the future. You can make the world tolerant or racist, by your actions or lack of them. It is your choice – your right and your responsibility,” she said. Theodor Herzl is known for its independent and values-driven education, with ethical themes such as tolerance and accountability being actively applied to academic, cultural and sporting activities throughout the High, Primary and even Pre-Primary Schools. Campus Head Stephen Fay said the ceremony was also an opportunity to reinforce the importance of these values and contribute to the pupils’ development as responsible, caring citizens. ‘Holocaust’ is a word of Greek origin meaning ‘sacrifice by fire’. More than 1.5 million Jewish children and tens of thousands of other youths died under Nazi tyranny. In Israel, the sound of a siren stops traffic and pedestrians for two minutes of silent devotion on ‘Yom Hashoah Ve-Hagevurah’ (translated from the Hebrew as Holocaust and Heroism Remembrance Day). The April date was set on the Hebrew calendar in 1951, as it marks the anniversary of the Warsaw ghetto uprising. In 2005 the United Nations designated 27 January, the anniversary of the liberation of Auschwitz-Birkenau camp, as International Holocaust Remembrance Day. 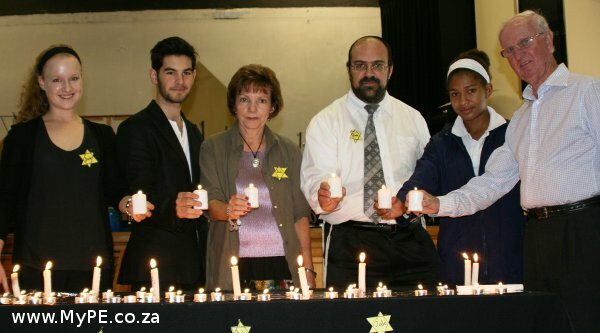 Amongst those who lit candles in commemoration of Holocaust victims at a special Remembrance Day ceremony at Theodor Herzl High School on Tuesday were, from left, pupils Jessica Mandel and Seth Bulkin, Judaica and Hebrew teacher Esther Levitan, Rabbi Shmuel Bloch, pupil Paula Barreto and guest speaker Peter de Decker.